Making a good first person shooter is not easy. On one end of the spectrum, you have awesome games like Operation Flashpoint and ArmA II, which deliver the gritty realism of combat in every sense of the word, and on the other end, you have flamboyant, utterly unrealistic and silly arcades for teenagers and senior citizens like Call of Duty. In between, a handful of good games, like Urban Terror and family. But decent, fun, engaging shooters are rare. 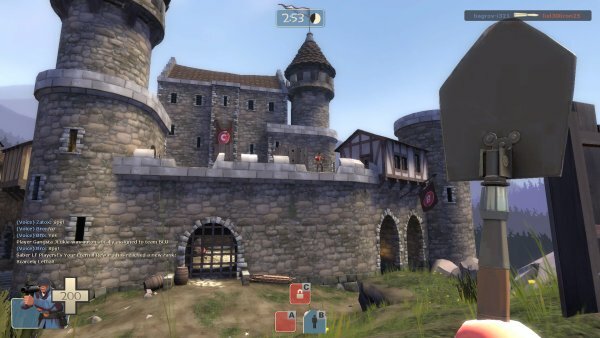 Team Fortress 2 is a free-to-play multiplayer shooter developed by Valve Corporation, the guys behind Steam, and the game is indeed available through their Steam service. Runs on Windows and Linux. The requirements are fair, but the premise is even fairer: A game that does not try to be an in-your-face would-be realistic enactment on combat; instead, it is meant to be fun. At a first glance, you might be a little confused, because the game really offers a lot. 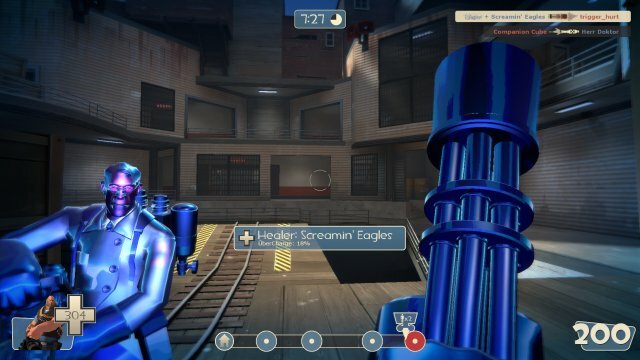 In Team Fortress, you play as a member of either the blue or red team. So far so good. Regardless of which side you choose, you can select one of the nine unique player classes, specializing in offensive, defensive and support roles. As you may have already figured out, offensive characters are lighter and faster, the defensive ones are slower and more heavily armed, and the support cast is comprised of your less-popular combat types. 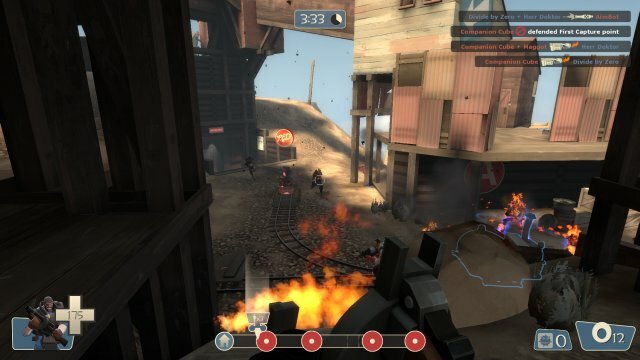 In the offense role, you can be either the Scout, Soldier or Pyro. 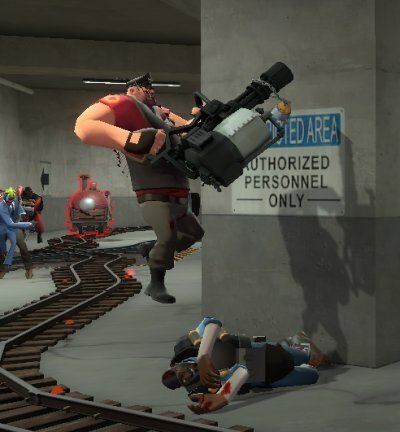 When playing defense, you can choose the Demoman, Heavy or Engineer. 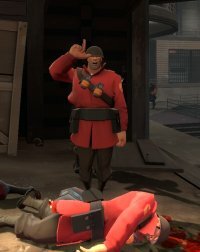 Medics, Snipers and Spies play your support roles. Now, here's the nice thing. Each one of these has its own strong points and weaknesses. Each demands that you utilize a different play style, different tactics and approach to combat. And when you combine a handful of players into a team, you get strategy. 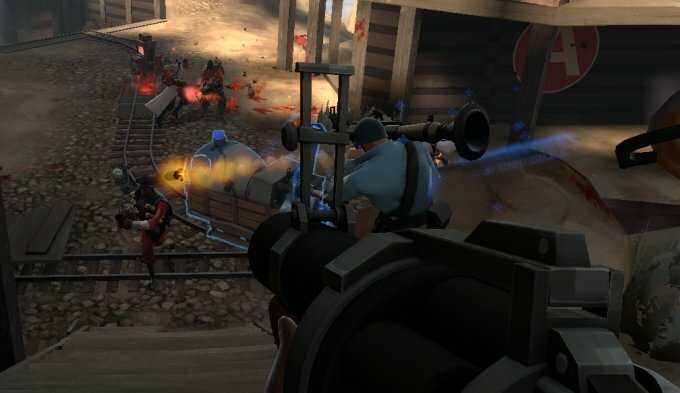 Charging an objective with five Heavies wielding miniguns is not that interesting. 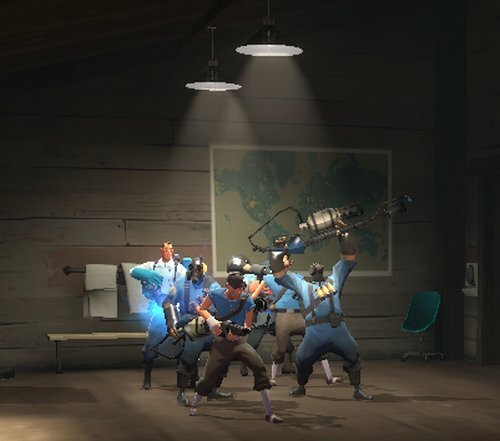 But if you can have Engineers building defense machine gun tripods or teleporters, Medics healing your units, Snipers taking headshots from afar, and scouts operating behind enemy lines, it all becomes so much more engaging. There's no single formula to victory, the gameplay is far from linear, and different situations require some mind sweat. Then, you have your awards, special moves, as I like to call them, and backpack items. As you play various missions, you will slowly accumulate items of worth found thrown about map levels or you will unlock them after performing an incredible stunt or a killing spree record. These will go into your backpack, and you will be able to use them now and then in critical situations. Think of them as magical powers, if you will. Special moves can be considered secondary actions of your unique weapons. 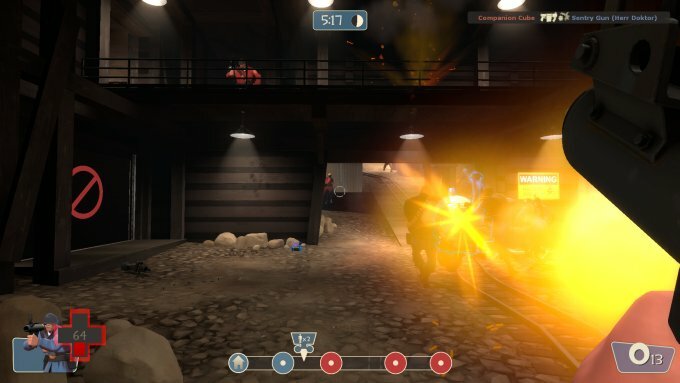 For example, Pyro can use his flame thrower in the secondary mode to deflect enemy fire back at them. 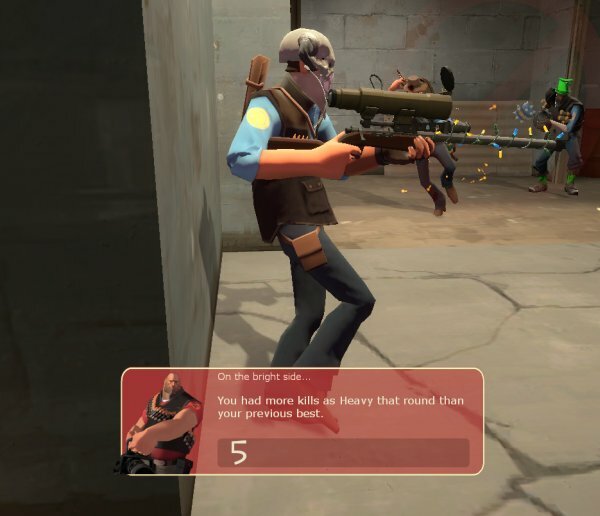 The Heavy can move with the minigun rotating and ready to fire, without wasting time to spin it up for the first round. 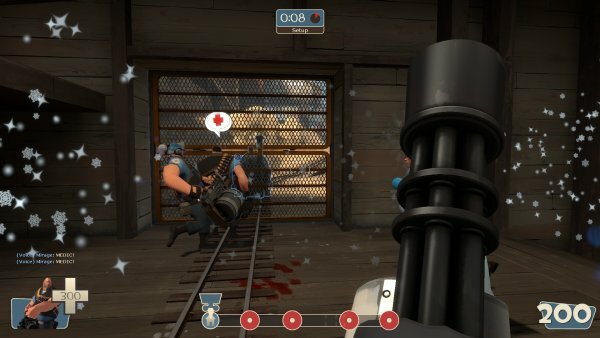 Medics can ubercharge your health if they remain in close proximity to you for a certain period of time. 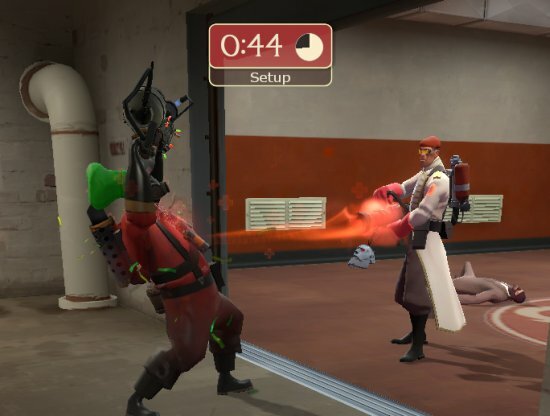 Spies also have their backstab move that will kill an opponent with a single blow. All of the units have several weapons. You can fight bare-handed, with a short-range weapon like a pistol and a long-range, main unit. Engineers can assemble and destroy a variety of structures. 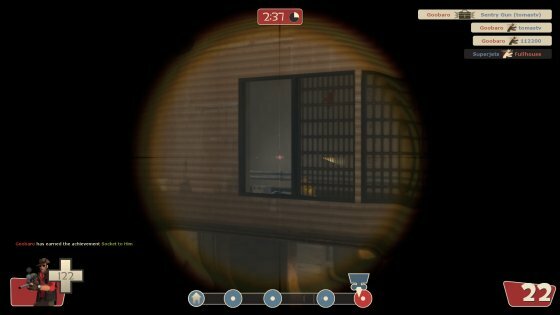 Spies can sap life energy from nearby enemy troops. Then, when you thought it's all there, you can also trade your items and buy stuff online for real money. Plus, the game tracks your record and gives you beautiful statistics. And so it goes, getting all the more colorful and compelling. Map levels are fairly standard, with a handful of nice exceptions. Capture the Flag, Control Point and King of the Hill are the usual share of any multiplayer shooter. Then you also get the crazy Payload mission, where your A-bomb shaped rail wagon travels down a route only with your soldiers in proximity to it, and goes back if the enemy soldiers are swarming around it. Usually, one team pushes the wagon and the other tries to stop it from reaching its destination. Sometimes, you get both teams pushing at the same time. A perfect example of cooperative work that require thinking and wise tactics and, above all, teamplay. In the Medieval mode, all soldiers are armed with clubs and swords, except Snipers who wield the bow and arrow. Awesome. The best part about this game is not its free price tag, its unique missions or characters, not even the variety of maps. It's humor. 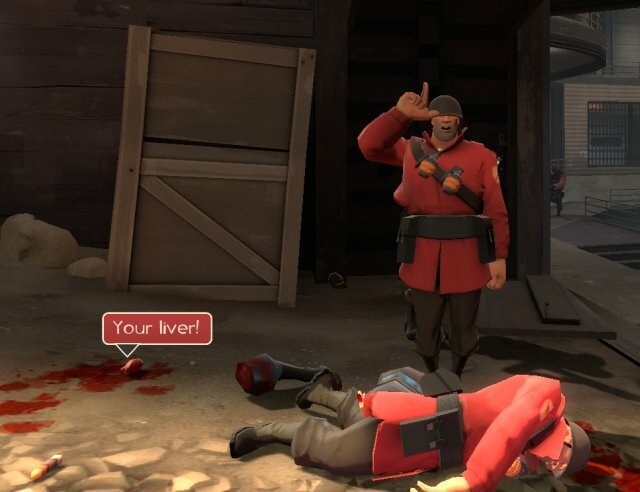 Team Fortress 2 does not take itself seriously. Nor should you. The game is all about being fun, without any silly pretentious agenda. And this is where most titles fail. By trying to emulate reality, they become weird, bloated graphics guzzlers that sacrifice quality for haze and glare effects. 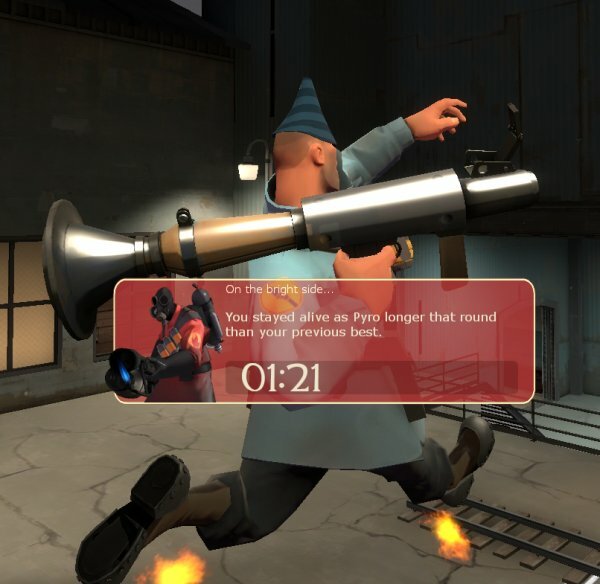 In contrast, Team Fortress comes with almost cartoonish graphics. No, scratch that. WITH cartoonish graphics. The characters look like a blend of Evil Genius super villain henchmen, including the accents and stereotypes. 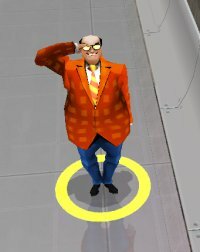 Austin Powers mode of thinking is evident everywhere, including the 60s-like trumpet tone cues when you die, the slow-motion camera rotations, the silly soldier salutes and gestures. It' all very trippy. On the left, Team Fortress; on the right, Evil Genius. Similarity much? 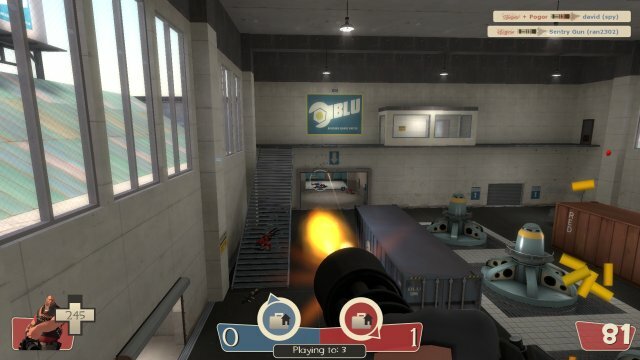 When you play Team Fortress 2, you put anxiety aside and focus on pure joy of blasting colors across your pixilated screen and you revel in the little nonsense details that add so much spice and fun to the gameplay. All the while you find the levels to be well designed and balanced. The cartoon styling also lets the developers have total freedom with how they design things, because there are no limits to how things ought to look. Tomorrow, they might choose to create futuristic space mission levels, and the game settings would naturally blend. So far, I have played the game only a handful of hours, but I am extremely pleased. 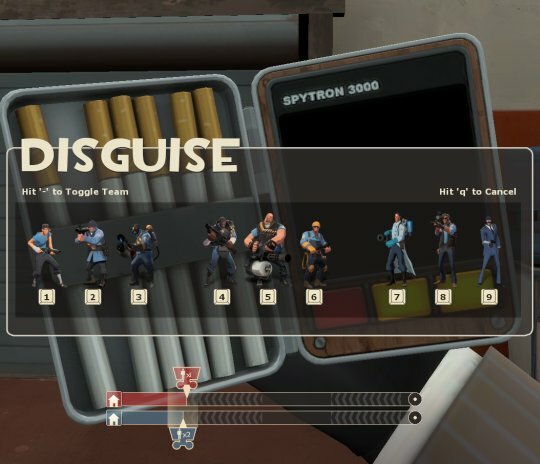 Team Fortress does not get boring. Although you may play the same mission types over and over, you can rotate your class, so in theory, every game can be replayed in nine different ways. Really addictive and fun. 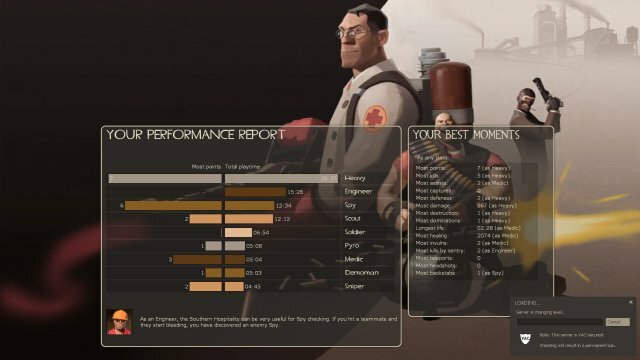 Team Fortress 2 is one of the more pleasant surprises in the gaming world in the recent months. It's not a new title, but its free availability is. The game comes with a beautiful visual display of colors and shapes without stressing your box too much, decent physics, superb humor, excellent side action that adds life to you game, unique action, and tons of other perks. Best of all, it runs natively on Linux. This game is a sure keeper. And if you play it through Steam, then your character history and achievements are preserved across your multiple machines and operating systems. 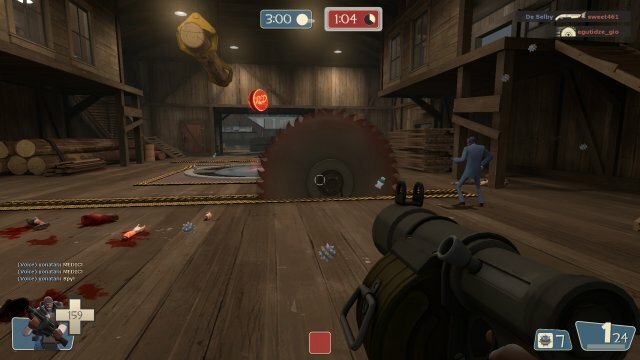 So I warmly recommend you download and install Team Fortress and have a merry go. You will be surprised. Moreover, I guarantee your games will be accompanied with a broad, quirky smile on your face. 10/10, yup.